Age as on 1-04-2018, Relaxation as Per CIL Rules. Education Qualification : Sr. Medical Specialist- MBBS Degree with PG Degree/Diploma/ DNB from any recognized University/ Institute and 3 Year Post Qualification Experience. Medical Specialist- MBBS Degree with PG Degree/Diploma/ DNB from any recognized University/ Institute. Sr. Medical Officer- MBBS Degree from any recognized University/ Institute approved by MCI/ SMC. Eligible Candidates can Submit Application at the Official Website of CIL latest by 28th July 2018. 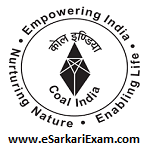 Applicants First Logon to Coal India Official Website. Open Recruitment of Medical Executives Link. Open Advertisement Link, Read Notification and Check Eligibility Details. Upload Scan Documents, Photograph and Signature.